Despite what others may say, wealth isn’t generated overnight. It takes years of disciplined investing and requires a well thought out strategy in order to achieve your goals. To reach your full potential, you need to understand compounding. Like an open highway, compounding returns offer a quicker route to your destination than taking the the side streets. But too often, people don’t have the right map. So how can investors receive compounding returns? A certificate of deposit (CD) is a savings product offered by most banks, credit unions and mortgage lenders. It’s structured to have a specific maturity date and comes with a fixed interest rate. Best of all, CD’s have zero risk. They’re insured by the Federal Deposit Insurance Corporation (FDIC) to a maximum of $250,000 per person. 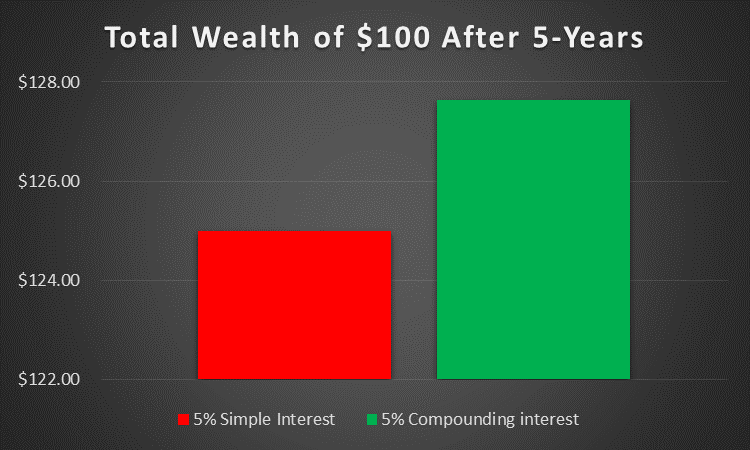 To illustrate the effects of compounding, let’s analyze a 5-year CD with a 5% annual interest rate. If compounded monthly, the annual yield becomes roughly 5.12%. While it doesn’t seem like much -- over time it adds up. After five years, the monthly compounded CD will result in a 0.71% increase in total return. On a $250,000 investment, that’s $1,775. Not so small after all. Unlike traditional bonds, zero-coupon bonds have no interim cash flows. You lend a specified amount and receive the par value of the bond (100) at maturity. ​For example, a $100, 5-year zero-coupon bond offering a 5% yield will be priced at $78.35. That works out to you lending $78.35 today and receiving $100 in five years. Again, the main benefit here is compounding interest. With a coupon-paying bond, if you don’t reinvest the interim cash flows, you’re only earning simple interest. With a zero-coupon bond, you don’t have that problem. So which investment carries the least risk? Well, in reality, both are equal. 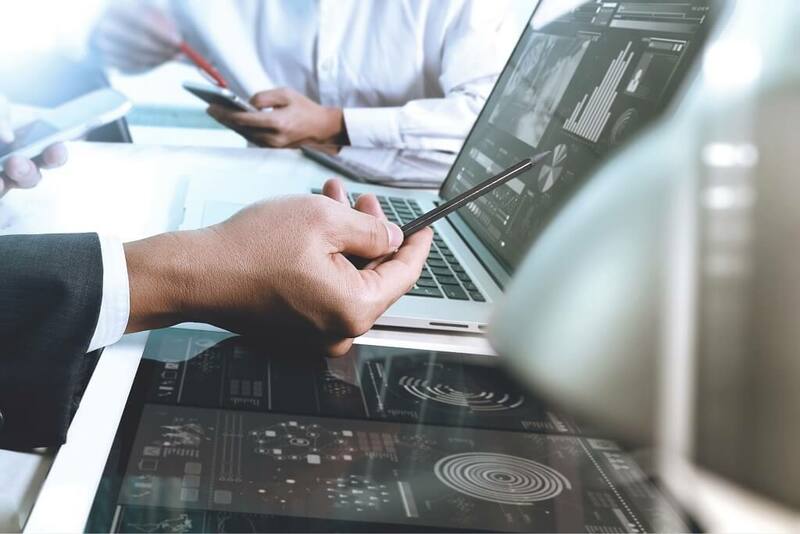 The CD is federally insured, while the zero-coupon bond – purchased from the US Treasury – will also be backed by the full faith and credit of the US government. A mutual fund is also a great way to ensure compounding returns. Most mutual funds don’t pay distributions (dividends) to investors and instead reinvest those dividends by purchasing more underlying shares. By reinvesting, the fund continues to earn compounding returns by purchasing more and more shares with each distribution. Second, most mutual funds pay a lower tax rate than the standard invidividual tax rate. Since dividends are taxed as income, paying the lower rate allows the fund to keep a greater percentage of its profits and generate greater wealth over time. This is for all you do-it-yourself (DIY) investors. If you choose to manage your own investment account, you can take advantage of an ETF’s distribution reinvestment plan (DRIP). The plan allows you to exchange all dividends received for more shares of the ETF. The key of course, is owning enough shares so the distribution received is enough to purchase a new share. Say an equity ETF has an average quarterly distribution of 21 cents per share and the current share price is $23. You need to own (23/0.21) 110 shares (rounded up) of the ETF to ensure you can participate in the reinvestment program. This requires a minimum $2,520 investment. Applying a passive strategy requires real discipline to hold your position during turbulent volatility. The reward though is compounding returns. By holding, you’re always invested so you don’t miss any rallies. As well, there are no tax consequences of selling or repositioning your portfolio. Similar to passive investing, you can apply a buy-and-hold strategy to earn compounding returns. But unlike above, buy-and-hold allows you to take an active approach with your portfolio. Analogous to a Warren Buffet strategy, you can pick individual stocks, sectors and regions, but the goal is to hold your investments over the long term. By doing so, you enjoy the benefits of compounding. You position yourself to take full advantage of any future price appreciation and avoid the taxable consequences of selling your holdings. Tax-loss harvesting is another clever way to earn compounding returns. The strategy is to use capital losses from losing investments to offset capital gains from winning investments. The result is tax savings. If you buy two $100 stocks, you have a cost basis of $100 for each. If stock A rises to $120, while stock B falls to $90, you can use the loss to offset the taxes owed on the gain. If you chose not to harvest, you’re tax bill – assuming a 15% capital gain tax – is (20 * 0.15) $3. However, if you harvest, your tax bill is [(20 – 10) * 0.15) only $1.50. The point is -- by tax-loss harvesting -- the $1.50 you save can be reinvested in the market and continue to earn compounding returns. If you didn’t harvest, you wouldn’t have the tax savings to reinvest. ​While products and strategies are important, it doesn’t stop there. The choice of where to hold your investments is just as important. You usually have three options to choose from, and because of compounding, they all have different effects on future wealth. 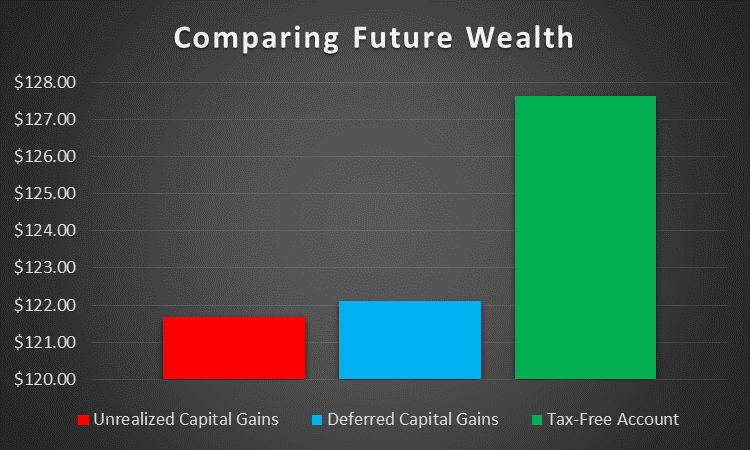 If you invest $100 for 5-years, earning a 5% annual return, where unrealized capital gains are taxed at 20%, you’re total future wealth is: [1 + (0.05 * 0.8)] ^ 5] * 100] = $121.67. As you can see, total future wealth increased by 43 cents per $100 invested. This illustrates effect of compounding. A tax free account is what most investors’ dream of. Dividends. Capital gains. You don’t pay a cent. Clearly, the tax free account offers the greatest benefit. Total wealth is $5.53 more – per $100 invested – than the deferred capital gain account and $5.96 more than the account where unrealized capital gains are taxed. As you can see, asset location plays a crucial role. Before deciding what investments to own, make sure you decide what accounts they’ll be placed in as well.